Man, I’ve been waiting a long time for A Matter of Life and Death to get the Criterion treatment. If there ever was a movie to deserve its own spine number, this is it. 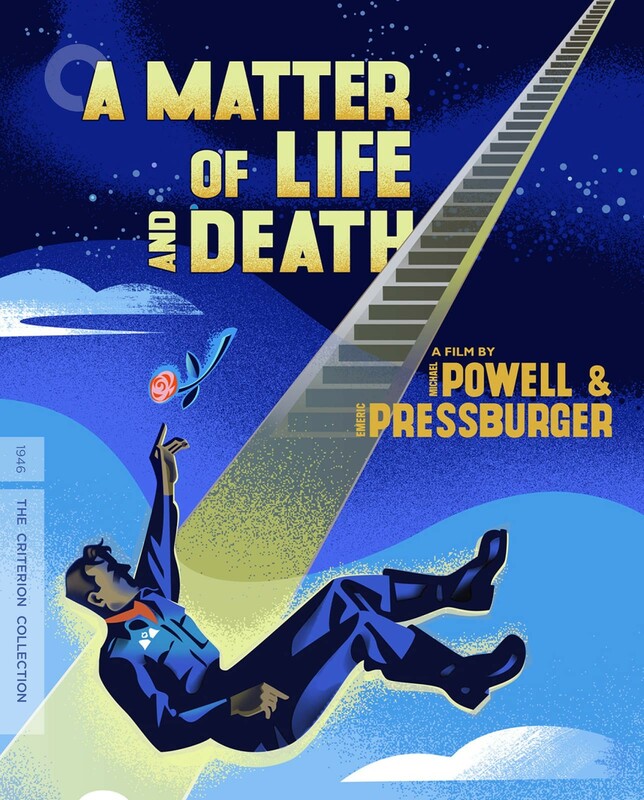 Released in 1946, A Matter of Life and Death is a post-war fable made just after the war had ended, when the rebuilding had only just begun. The concoction of Michael Powell and Emeric Pressburger, also known as The Archers, their movies sometimes described as Disney for adults, A Matter of Life and Death is their most original production, spawned fully from their own imaginations as writers, directors, and producers. A Matter of Life and Death stars David Niven as Peter Carter, an RAF officer who, at the beginning of the film, is in the process of crashing his bomber following what must have been a pretty nasty firefight. His crew has all escaped, except for his communications officer, who lies dead in his lap. 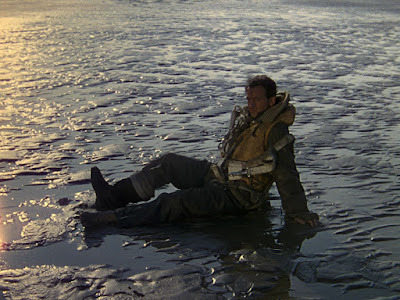 Carter does not have a parachute, and as he tells June (Kim Hunter, A Streetcar Named Desire, the American soldier on the other end of the radio, he’d rather jump to his death than burn in a crash. The two share a moment, knowing it’s meant to be his last. Only it isn’t. Instead, Peter washes up on the English coast. Cut to Heaven with a capital H, where they are waiting for him to arrive. The aforementioned communications man, Bob (Robert Coote, Scaramouche), has even delayed procuring his own angels wings, knowing his pal is due any moment. When this particular soul fails to materialize, it’s an unprecedented glitch in the system. The French conductor (Marius Goring, The Red Shoes [review]) meant to ferry him through the pearly gates missed Peter in the English fog. Luckily, retrieving him should be easy. Peter Carter was just lucky enough to receive an extra day of life. No harm, no foul. Except, as fate would have it, in those intervening hours, Peter found June, and the pair fell in love. Peter insists it’s not fair for him to have to let that go, as he’d never have known such romance had the celestial world not screwed up. Peter demands his day in court, the chance to appeal his own death. Divine justice being what it is, Heaven agrees. 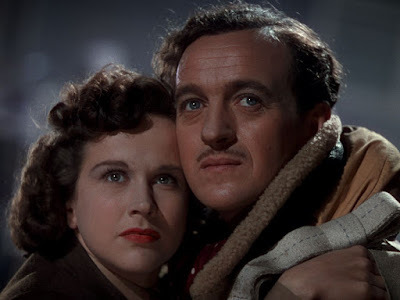 A Matter of Life and Death is split between two worlds: reality and...well, Powell and Pressburger don’t put too fine a point on it. I call it Heaven, but there is no mention of Christianity or Jesus, and the filmmakers take a rather cheeky, almost subversive approach to establishing their particular afterlife. This is a movie, after all, that opens with a view of the universe and an explanation of what each cosmic illumination represents delivered via an unseen narrator--one who implies he lives on Earth, too, and doesn’t claim to be a supreme being. His intro isn’t exactly a direct path to the mystical realm, unless we choose to accept science and religion as one. That said, A Matter of Life and Death pulls a reverse Wizard of Oz in that the Earth-based sequences are in color, and the afterlife sequences are black-and-white. If one rides the lengthy stairway to heaven, the film is monochrome; coming back down, even with heavenly bodies in tow, Technicolor! This choice alone would suggest that the Archers consider the real world and its concerns to be the more important. In fact, they kind of lean away from the afterlife as being a fantastical environment, instead suggesting it is just one big administrative bureau. All of this is less a critique on religion, though, than it is a device to encourage us to question whether Peter Carter is hallucinating the whole thing. On Earth, he is prone to headaches and, of course, sounds a bit crazy when he tells June what he believes is going on. She enlists the help of Dr. Reeves (Roger Livesey, The Life and Death of Colonel Blimp [review]), a neurologist. Reeves is a man of science, but one that also enjoys poetry, and the closest to a God-like figure we get in A Matter of Life and Death, in so much as he sees all from his attic, which is outfitted with a 360° viewer that lets him look across the entirety of their village, allowing him to diagnose the problems of his subjects from afar. Livesey gives a spirited performance, projecting a natural optimism, and showing the good doctor as capable of adapting to anything, eager as he is to figure the whole thing out. 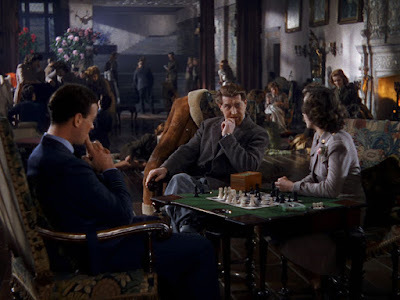 Reeves quickly diagnoses Peter, believing him to have a rare neurological condition that so disrupts the senses, it only stands to reason he thinks these visions of another world to be real. Every part of his body says so. A Matter of Life and Death offers no absolute stance on what we should believe, it champions no one internal truth. Peter goes on trial and has his day in Heavenly court, but is that really happening, or is the eventual verdict a product of the surgical operation he is undergoing on the ground? Narratively, I’d argue that the only proof we need is that the story regularly leaves the main character, so unless his brain is even writing the chapters of the story he is not supposed to be privy to, the other side is really looking to take him as their own. 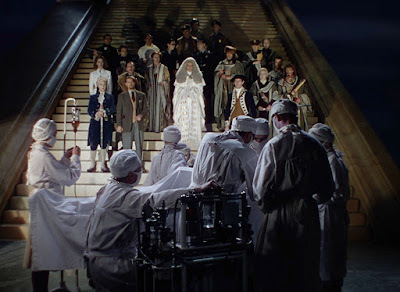 As with all Powell and Pressburger films, A Matter of Life and Death is a visual treat. 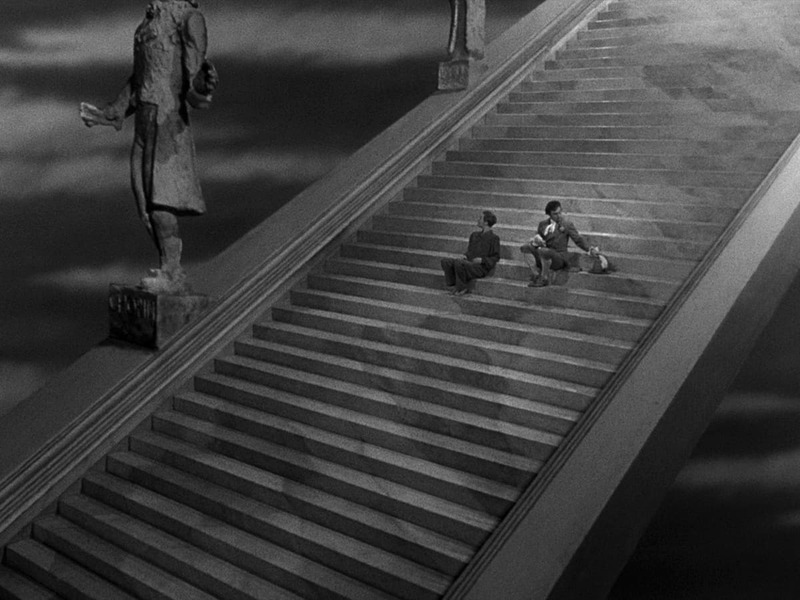 The large stairway to Heaven has the cosmos as its backdrop and statues of famous figures from history as decoration. Heaven itself is a space-age design, all curves and clean surfaces, well ahead of the space age. Gorgeous matte paintings and elaborate models are used to give the wide view of paradise. Cinematographer Jack Cardiff (Pandora and the Flying Dutchman [review]; subject of Cameraman [review]) gives the black-and-white sequences a sort of internal glow, as if it is suffused with light; alternately, he makes the earthbound scenes bright and colorful, creating the exaggerated reality that is the Archers’ stock in trade. For all its heavier questions--including a debate about the virtues of freedom, and how they manifest differently and sometimes the same in both Britain and America--A Matter of Life and Death is another of P&P’s fantabulous fairy tales, full of romances and comic touches. 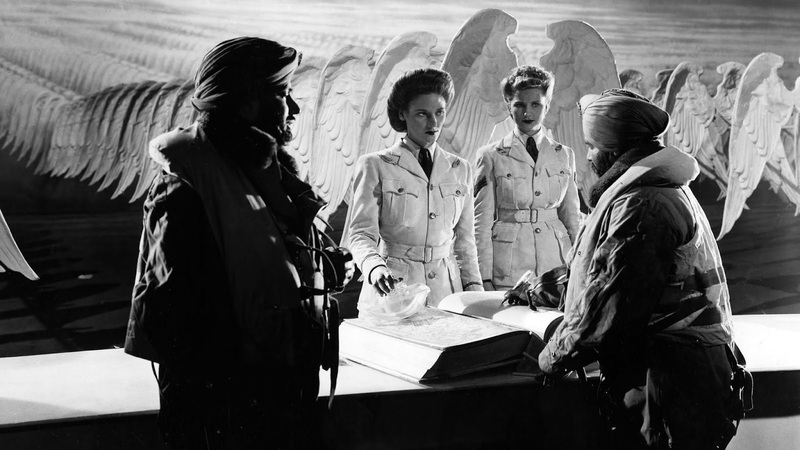 (The arrival of a crew of American pilots to check into the hereafter is a particularly funny aside; likewise, the dig at James Cagney in the Midsummer Night’s Dream rehearsal on the military base.) It’s an enchanting mystery, more movie magic than genuine mysticism, and perhaps one of the best examples of how cinema can transcend the everyday. I saw it for the first time some two decades ago, during a revival and restoration championed by Martin Scorsese, knowing very little going in. Needless to say, I was mesmerized. 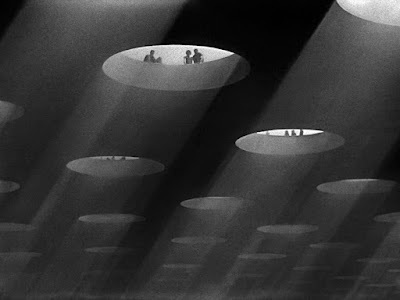 Back then, I was watching it on a big screen with an audience, and I have since seen it on the smaller screen with friends and now on my own, and the change in venues by no means diminishes how spectacular A Matter of Life and Death really is. In fact, this current high-def restoration may be the most magical its every appeared. It’s an essential purchase, and so good I wouldn’t have blamed Criterion if they had waited to release it so it could have been #1000 rather than #939...but I’m glad they didn’t.